The treatment of a large audience hall is similar to that of a church, and is usually warmed in one of the three ways already described. Where a fan is used the air is commonly delivered through wall registers placed in part near the floor and partly at a height of 7 or 8 feet above it. They should be made of ample size, so that there will be freedom from draughts. A part of the vents should be placed in the ceiling and the remainder near the floor. All ceiling vents both in halls and churches should be provided with dampers, having means for holding them in any desired position. 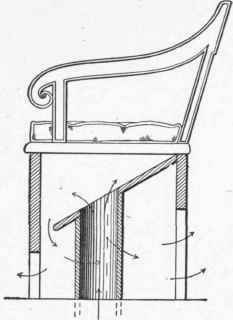 If indirect gravity heaters are used, it will generally be necessary to place heating coils in the vent flues for use in mild weather; but if the fresh air is supplied by means of a fan there will usually be pressure enough in the room to force the air out without the aid of other means. When the vent air ways are restricted, or the air is impeded in any way, electric ventilating fans are often used. These give especially good results in warmer weather, when natural ventilation is sluggish. The temperature may be regulated either by using the double duct system or by shutting off or turning on a greater or less number of sections in the main heater. After an audience hall is once warmed and filled with people, very little heat is required to keep it comfortable, even in the coldest weather.